What a difference six weeks makes. 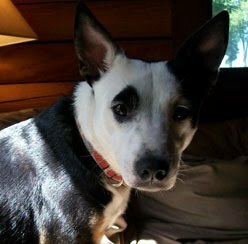 Maybe you read the post I wrote back in March about my one-year-old borderstaffy, Fringe, called "The Project Dog." In it, I lamented about neglecting her training for too long and how I was now having to make up for lost time. She has transformed so much in the past few weeks. She is loose in the house almost all the time now, where she is either snuggling with one of us, working with one of us, or sitting on the floor staring at one of us whining to work. Or wrestling with Punk (they sound like two baby dinosaurs crashing around on the floor). Here is what she looked like today on the box. I'm using a target stick to point at the box, clicking her when I see that she has put all 4 feet on it, then treating her with cheese. As I watched the video afterwards I could see that she was drifting wider and wider off the box because of where I was standing with that cheese...she kept moving closer to me instead of popping off into the middle of the lane. So what I need to start doing is transitioning over to her tug (held out into the center of the lane), or at least throw the cheese out on the floor so she makes more of a 180-degree turn on the box. Fringe has been to two tournaments since the first "Project Dog" post and has really come out of her shell in public. My teammates were taking her out of her crate and playing with her and walking her around, and she was thoroughly enjoying it. She tugged with me inside the tourney site. Plus, she didn't get carsick! I put her crate right behind the driver's seat on the floor and covered it with a sheet, which probably had a lot to do with it. It just goes to show what a little training and extra attention can do. I'm still mad at myself for letting her sit on the back-burner for so long, but I'm happy to see her progress. She is looking pretty good after only 6 weeks. Gotta love to see progress. She is following the target stick like glue and part of the reason she is coming wide is that you are stopping the stick movement by your knee. It might be time to fade the target stick. Or throw the cheese to the left side of the lane so she has to continue turning a bit to get to it, or switch to the tug as you mentioned. The turn looks very nice, though. She's getting on and off very fast and is relaxed. I clicker train and I don't care for target sticks. Yet, people seem really fond of them for box turn training. Can you help me understand why you think it gives you an advantage? (I am not arguing -- I think I"m being dense.) I tried to get Nano targeting a stick to do a wall turn and it was a FAIL... after weeks of effort I moved on to other tinkering and finally have a grip on his turn. Is it me? Is it him? Is it the stick? Thanks. Greta, you are so right about her following the target stick. I got a few private emails about that, too. I think everybody agrees (including me!) that it's time to phase out the target stick AND start throwing the food into the center of the lane (or switching over to another reward like the tug). I really like the target stick b/c it is like an extension of my arm/hand and lets me stand farther away from the wall or box while still being clear about what I want the dog to touch. That means i'm out of the dog's way and i have a head start on them, too -- i can point somewhere with the target stick (a la Elastigirl from the Incredibles) and already be moving away and using my other hand to hold out the reward so that I get more of a 180 degree turn. I have never used a target stick so I can't say one way or the other. I can see the point though. FWIW, I use a food lure for about five reps, then an empty hand lure until the dog is offering the behavior, and then I stop luring altogether. I'm not saying that's the best way -- I've gotten some very good turns this way, and some not so great, or which have required troubleshooting. I tend to use props to get the feet position adjusted, and then fade those - I can get a long way away, since I am not doing the work, the props are. I would like to go "study" with someone who does this target stick thing, and the wall thing, to see the process unfold. Why throw the motivator away from you? The dog should ALWAYS get the motivator from you and you and your dog should enjoy the motivator together, whether that is food, a tug or whatever else folks use. You and your motivator are essentially the end of the game or the end of that portion of training so I want to have the motivator so that my dog knows I'm the one with it and that we are going to have a ton of fun with it. The best part of training is not just the exercise the dog performs but the reward the dog gets for doing the training well. Just my two cents. This is cool to watch. What I am needing to learn is to teach the approach/return - I think it is much more complex than I imagined before. 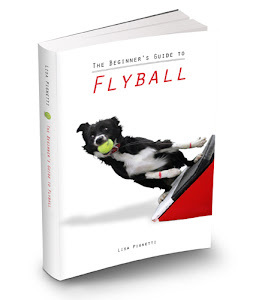 If I might be so bold, considering that I haven't been in flyball very long...if I am being too direct let me know. At this point, you should be able to "release" Fringe to the box, from where you are currently standing, as she launches onto the box, you turn "down lane", sweeping the reward in your right hand across your body at a height below your knees, call her sharply, at the same time moving away from the box. Increase the speed steadily, and never reward "cheating/short-cutting". And never get in the "lane", yourself. Executed quickly and smoothly, you end up with your back to the box as she launches off it chasing after the reward that is moving away from her down the center of the "lane", and you will have to review the video to determine whether it was "proper". I enjoy watching the process of handler and dog learning new tricks. Some times, the dog is waiting for the handler to catch up, sometimes the handler is waiting for the dog to catch up. But then, the student has me for a teacher...hmmm. Have fun, and please keep sharing. I choose to throw the reward away from me at the beginning because well most of the time I am not fast enough to get back to where I need to be. Between my bad knees and bad back - I can't move as fast as I would like (avoiding shooting pains is key to happy training). If I am using a toy as soon as the dog has reached I am usually there and we will play. Play time is just slightly delayed. Once the dog is pretty sure I want the reward does come from me no matter if it is a toy, tug, food, etc... and the fun begins.